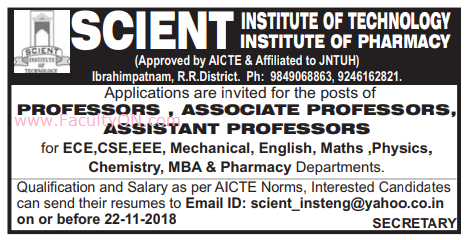 SCIENT Institute of Technology, Ranga Reddy has advertised for recruitment of Teaching Faculty- Professor / Associate Professor / Assistant Professor jobs vacancies. Interested and eligible job aspirants are requested to apply on or before 22nd November 2018. Check out further more details below. About College: Scient Institute of Technology, an ISO 9001-2000 Certified Institute popularly known as SCIENT – is the first Engineering College in Ibrahimpatnam on the Sagar Road established in 2001 and is one of the most reputed engineering colleges in the state of Andhra Pradesh affiliated to JNTU, Hyderabad. It is located in 32 acres of lush green sprawling campus. It is approximately 25 km from Hyderabad and well connected by a network of roads.